This just proves it: Canadians are smarter than Americans, at least when it comes to birth. The Society of Obstetricians and Gynecologists of Canada has announced that c-sections are no longer recommended for breech babies! Since 2000, C-sections have been the preferred method of delivery in breech births. Studies suggested that breached births were associated with an increased rate of complication when performed vaginally. As a result, many medical schools have stopped training their physicians in breech vaginal delivery…With the release of the new guidelines, the SOGC will launch a nationwide training program to ensure that doctors will be adequately prepared to offer vaginal breech births..The new approach was prompted by a reassessment of earlier trials. It now appears that there is no difference in complication rates between vaginal and cesarean section deliveries in the case of breech births…Cesarean sections, in which incisions are made through a mother’s abdomen and uterus to deliver the baby, can lead to increased chance of bleeding and infections and can cause further complications for pregnancies later on. 70% of breech babies can be delivered safely without surgical intervention, according to Dr. André Lalonde. My daughter was breech up until eight months in utero. We had our breech scare that the homebirth we envisioned would not be possible, but with the help of some exercises, she turned. We also could not find a doctor that would attempt a vaginal breech delivery, should we have to go that route. I have two friends that have successfully delivered breech babies vaginally, only because they did not make it to the hospital in time for a c-section. This change in Canadian policy is exciting and reflects the importance of natural childbirth choices for families, no matter what the baby’s orientation. I love this news! Being a mother of twins, I learned my options were quite narrow. Many twin births (due to the fact that one or the other is breech) are automatically scheduled as C-sections even if the mother wishes to try a vaginal birth. The women are told that if they attempt to birth the first child vaginally, the second will end up in a c-section regardless due to breech position! I am glad the Canadian women will have more choices available to them now. Here in NB, which is so great in so many ways but rather backwards in others, midwifery is still illegal (though they’re finally beginning some introductory trials). This is great news. I wish the US was smarter about breech births. But Canadians have socialized health care. In a for-profit health care system Dr’s make big bucks performing C-Sections. I have to comment on the first commenter: How ridiculous for Dr’s t say that the 2nd baby (of the twin pair) that is breech will end up in a C-section regardless. You mean twins never existed in the history of the world until we had C-Sections! Sheesh! They just didn’t want to admit that they weren’t trained for it. That most Dr’s today in the US have never witnesses a live breech birth!!! Anyone who feels strongly that ACOG should revise their position on breech and encourage OBs to be trained in safe breech birth skills, can contact me at craigiecarter at gmail.com, or Robin Guy, co-founder of the Coalition for Breech Birth, at breechbirth at gmail.com. My grandmother was told by her doctor back in 1950 when her first child was breech: “We *MODERN* obstetricians have no problem delivering breech babies safely.” No complications. My mom was told by her doctor in 1977 that he recommended a c-section but agreed to do a vaginal delivery when my mom said that’s what she wanted. No complications. When my oldest was still breech at 34 weeks in 2002 every doctor I spoke to flat-out refused to consider a vaginal breech delivery. I was saved from an automatic c-section when she finally turned. It’s absolutely ridiculous that we’ve gone so far backwards from my grandma’s era to today. I’m a 50 year-old product of a frank breech vaginal delivery. I was 41 1/5 weeks gestation. My mother said I was the first Lamaze delivery in Salt Lake City, although she said they “put her out” when they delivered me, frank breech. I know that they must have given her general anesthesia during the birth, but all she remembers is that she was the first mother using Lamaze during labor. I have had chronic low back pain since I was a teenager. Last year I was found to have partial congenital hip dysplasia, undiagnosed as a child. After having a hip injection with steroids that alieviated my pain for about 4 months, I’m now facing the fact that I must have a total hip replacement. Both of my hips are dysplastic, but the right hip is worse than the left. Please don’t think that delivering a baby breech is without consequences in the future. I’m proof of that.. I’ll need both hips replaced before I’m 55, if I’m lucky. And I’ve had a life of back and hip pain to prove it. Think twice mothers……. That is most likely due to sitting in that position in utero so long. A surgical delivery may not have prevented that. My sister has brachial problems and she blames her breech vaginal birth 56 yrs ago for it, but there is no evidence that c/secs prevent it. One of the reasons babies end up in breech position is that they already have the hip dysplasia. It was not the method of birth that caused it as it was already there. Method of birth has been shown not to affect this outcome. 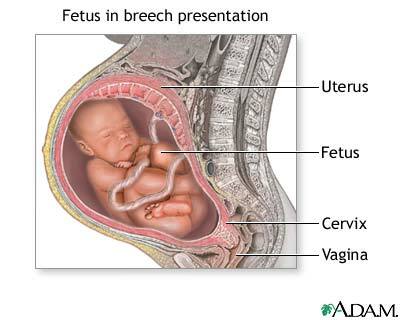 Please see the Term Breech Trial and the PREMODA study that was done subsequently. It is being carried in a breech position and growing in a breech position during pregnancy that causes the hip dysplasia, NOT being vaginally delivered breech. I have carried 3 children breech. The first was born by c-section, she had been breech from at least 30 weeks, and I was told we needed to check her hips after because she was in a breech position inside me, nothing to do with how she was delivered. My 2nd and 3rd children were twins, both carried breech from 25 weeks to delivery. The first twin was born vaginally in a breech position (she was bum first) and the second twin flipped on his own after his twin sister was out and was born head first. Both babies needed to be checked for hip issues because they were carried breech. The mode of delivery has nothing to do with having hip issues, it is a problem with how the babies hips grow and how the joint forms and fuses when the baby sits in a breech position. A c-section would not have saved you from the pain or the hip replacement surgery since your hip joint did not form properly due to the position you were in BEFORE you were born. So mother’s do NOT think twice, delivery your breech baby in whatever way you feel is best, and if you carry a breech baby, whether you deliver by c-section or vaginally, have it’s hips checked, as babies hip joints do not always form properly when sitting in your pelvis. If my experience can help someone facing an option of delivering breech, or having a c-section, then it was worth the time to write all of this! sorry for my lack of editing…many errors in my long post! My home birth doctor (Dr Nial Ettinghausen, deceased) assisted many, MANY breech births, with total success. It’s so much gentler and safer a way for such a baby to come into this crazy world. DR Ettinghausen delivered babies AT HOME for 40+ yrs! I was born frank breech in 1974, at Misericordia in Edmonton 🙂 My poor mum was in labour for two days, and her doctor later lost his license, but despite all that, we were both healthy (well, aside from my mom’s double episiotomy…). Apparently my first act, before I was even completely born, was to pee on the doctor. I did find it quite galling that if my own children, born in 2000, 2003, and 2007, in NH, USA, had been breech, I would have had no option but c-sections. Strange to think that we’ve gone backward since the 70s. Yes, in Canada new guidelines have been issued. But your headline is very misleading. They have *not* said that vaginal breech is better for babies, not even close. They have said it should be offered as a *choice* under certain carefully selected circumstances. In fact they say that being born vaginally is harder on breech babies in the short term, although they seem to do fine in the long term; and that since caesarean births are hard on women in the long run, women should be given the chance to weigh the risks and benefits and make a choice. The reality is that nearly a year after the report came out I still have clients being told they have to have a c/section for breech. Thanks for telling us Canadians how smart we are. But let’s not go *too* far over the top! @Sharon, if your mother was “put out” then it was most definitely NOT a hands off breech delivery which is the method recommended for breech deliveries. With that in mind, any manipulation and likely the use of forceps might well be the culprit for your back pain. There is much to recommend vaginal breech delivery, there is also much to recommend healing modalities such as chiropractic, cranio-sacral therapy and the like to help heal birth injuries related to interventions and even normal variations such as the breech position. Gee, thanks Canadians. It’s not like the majority of American women who have breech babies at delivery time wish to be cut open and have their babies pulled into the world surgically. I’m so glad that your “evil socialized medicine” will pay for midwives and that your physicians do not have to worry about malpractice lawsuits as much as ours do here in the USA. That must make you all feel so good and proud of yourselves to say that Americans aren’t smart when it comes to birth. The only thing that separates us is a border of land, so OBVIOUSLY living further north (in most of your cases) makes you so much more informed and intelligent on this matter. I am currently 36 1/2 weeks pregnant with fraternal boy twins, and have found out this week that they are breech/breech, when before, Baby A was head down, and Baby B was transverse. I’m trying like mad to turn them, especially since I’m trying for a twin VBAC. I liked reading the article, and was happy for Canada. Now I’m just disgusted by the sour sentiments coming from MY neighbors to the North. Thanks a lot. What are you talking about? I read over all the comments and can’t figure out why the bashing of your “neighbors to the north”? So confused. What sour comments? Will the EPA survive the Trump presidency? $5,000,000 Donation from BPA Supporter: Conflict of Interest, or Business as Usual? Autism and Chemicals, Cancer Report Under Fire, and Kudos! Choose the New Character for Hank D and the Bee!